Over 200 young people from across the Diocese of Clogher were ‘sent out’ last weekend as diocesan representatives and leaders for a number of pilgrimages which will take place over the coming weeks. The ‘Mass of Sending’ at St Macartan’s Cathedral, Monaghan on Saturday night was presided over by Fr Leo Creelman, chaplain to Clogher don Óige, the diocesan youth ministry that was founded in 2003 and which seeks to inspire young people to grow in esteem, confidence and faith. The pilgrimage journeys this cohort of 200 will take part in include the annual diocesan pilgrimage to Lourdes; ten days of prayer at the ecumenical community of Taizé in France; and World Youth Day in Krakow, which will be attended by Pope Francis. Ahead of the Mass, the 200 young people plus their leaders walked to the cathedral from Coláiste Oiriall after their final preparation day for their respective pilgrimages. In his homily on Saturday night, Fr Creelman emphasised that the young people are being called to fulfil the mission entrusted by Jesus to the Church to make his love and compassion known to all. “In keeping with the message of St Pope John Paul II, these young people are answering the call of Jesus to be the hope for the future,” he said. He said that through their participation they too have answered the call to be disciples of Jesus in their own way. 100 of our young people will travel to assist with our elderly and infirm pilgrims in Lourdes on our upcoming Clogher diocesan pilgrimage on 6-11 July. 80 more will travel to Taize next weekend to join with up to 2,000 other young people from all over the world, spending time together in different activities and praising God through the Taize chants. Others will represent Clogher diocese at World Youth Day which sees millions of young people from all around the world converge on Krakow. A number of the young people will also take part in one of three Assume summer camps in Newcastle Co Down. Throughout all the various activities and travels, the youth will be joined by over 30 trained leaders, who voluntarily give up of their time, right throughout the summer to be with our young people. “The leaders all answer the call of Christ to discipleship with great commitment and enthusiasm, enabling the youth of our diocese to have these commendable experiences,” Fr Creelman said. He described their blue distinctive sports tops as their uniform and their identity wherever they travel. The jersey bears the CdÓ logo, a cross which is on the left hand side, directly over the heart. Of those who were commissioned and sent forth last Saturday, 100 will travel to Lourdes between 6-11 July on the annual pilgrimage which will again be led by Bishop MacDaid. There they will play a pivotal role, especially for the assisted pilgrims. They will also participate in all of the exercises and liturgies of the pilgrimage to the Marian shrine. A further 80 will travel on pilgrimage to Taizé between 2-11 July. There they will join over 2,000 other young people from around the world in activities that have a strong faith emphasis. They will pray three times each day and live a basic community life, in a place that, since its foundation in 1940, has become famous for being an ecumenical space of prayer for all Christians and for its well-known chants. Later, some 12 young representatives from across the diocese will travel to Krakow for the World Youth Day between 25-31 July. This will be attended by Pope Francis. This year marks the thirtieth anniversary of the establishment of World Youth Day (WYD) by St John Paul II in 1985. It is appropriate therefore that this year’s event takes place in the city where he was the Archbishop and where he lived for much of his life. The programme for WYD will include catechetical sessions with visiting bishops, a walking pilgrimage to the event site, celebrations of the sacrament of reconciliation, the sacrament of Eucharist and other occasions of prayer, including a Saturday evening vigil of prayer with Pope Francis. The WYD will conclude on Sunday 31 July with a Mass after which the venue of the next will be announced. In addition, many of the young people will participate in three Assume summer camps organised for Newcastle, Co Down later in the summer. Among those commissioned on Saturday last were over 30 trained leaders who voluntarily give up their time over the summer to be with the young people. 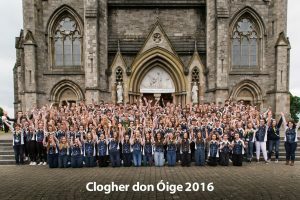 Most of these have been on similar pilgrimages in the recent past and have all undergone leadership training and faith formation, provided by Clogher don Óige.